Editors Note: Look for new articles from Raechelle in the upcoming months. Rae and Mitch have long been supporters of iZook. Raechelle has recently been added to the iZook staff as a contributing Author. Thanks Rae! Larry and Terrina Harris, Jody and Lisa Ellsworth and Mitch and I left Friday morning and headed out for a weekend of wheeling at the Badlands in Attica. Sweet Attica ...Indiana that is. It is like coming home again! 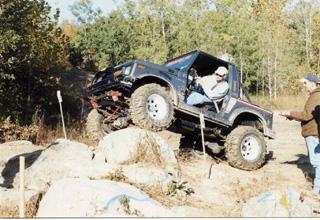 Though Mitch and I have only been there twice now, once for the Y2K ZookiMelt and for this year's fall fest, if the Badlands were in our backyard we'd all probably quit our day jobs and spend all our time wheeling! It is a five-hour drive give or take, and since all our group flat tow their Zook's we can't speed. The weatherman was calling for very cold temperatures with the chance of freezing rain so we all wimped out and decided it would be better to stay at a motel instead of camping. If you ever get the chance to go to the Badlands, and you do not want to camp, I am here to tell you that unless you want to stay at a B&B (bed and breakfast) the closest hotel/motel is a good 20 minutes away traveling by Zooki. We stayed at a very small out-of-the-way place but it was the closest place to Attica. It was warm and the beds were soft, I know we all were thankful for that after wheeling all day. We got down there in the early afternoon and after checking into the motel, unpacking, reconnecting drive shafts, and changing around tires we were ready to hit the trails! We got to the Badlands and registered, they checked out our rigs and let us know what kind of trails that would best suit our setups. We were all in the trails rated 3-4. They rate the trails on a scale from 1 to 5. One being the easiest and five being the most difficult. But we had arrived too late in the day to go out on a guided trail. Oh well! We hopped in our trucks and headed out on our own. It was cold!!!!! All of us needed to have on more clothing! It stayed in the mid-thirties all weekend and dipped into the low twenties over night. We ran around a little bit and ended up in the gravel pits, they have some nice steep chutes that scar the faces of the "gravel dunes." Jody, Larry and Mitch took turns running up and down these for a while, crawling and gassing it. Everyone was hanging some tire. It made for some good photos and video. We finally ended up over in the rock quarry and found out that they were going to be having a rock crawling competition in the rock garden. Jody and Larry took a good look at the course and Jody ended up running the course with Larry as his spotter. I think it was five dollars to enter and you were scored, whoever had the best score took the money. I have never seen anything like that, watching it was very cool. Jody eased his Zooki thru this gate and that one, on and over a huge rock onto another. He did very well too. 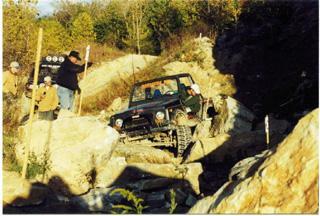 The "rock crawl" was to be a two day event with your scores added up and the highest grand total points was to be the winner. Jody was in good standings at the end of the event on Friday, but Saturday's course was going to be setup as an expert course. It was a lot more difficult than the course on Friday. I do not think that I have ever seen so many Jeeps in one spot ever! 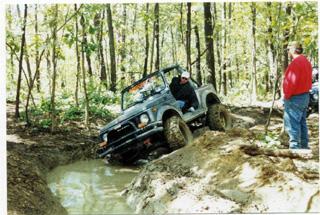 CJ's, TJ's, YJ's, Scrambler's, even a few old Willey's were there. There were some of the most interesting trucks there too. There were some hybrid homemade trucks down there that were called the "recon" trucks, no windshields all diamond plate bodies, built just for wheeling and you could tell that just by looking at them. There was a Ford 250 Supercrew with the biggest tires I'd ever seen in person! There was even a '99 Land Cruiser all done up. Some of the trucks were just amazing the way that they were built, you could tell that the owners had put a lot of time and thought into their setups. There were also a few that had very little done to their trucks but nonetheless I am sure that everyone had just as much fun as the next guy. It started to get late and we were all starving so we headed out of the trails for the day. The Wabash Valley Trailblazers that put on the event along with Sports in the Rough fed one and all in a huge spaghetti dinner. After eating, we hooked the trucks back up to our tow vehicles and headed back to the motel. The six of us all ended up in our motel room watching the video footage of the day's events on Jody's video camera with its three-inch screen! All of us were so tired that we called an early night and hit the sheets. Saturday morning, still freezing cold, but no sign of rain or snow. There was a nice wind though. Three layers of clothes were still not enough to stay warm. We were still going to have fun. Packed for the day, we set out for Attica. We got to the Badlands and ate our free breakfast in a rush. We were running late and didn't want to miss meeting up with our trail guide for the day. 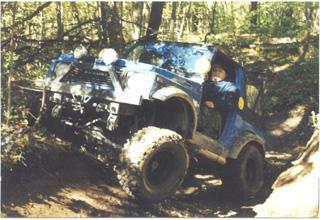 We ended up wheeling with a half dozen Jeeps. 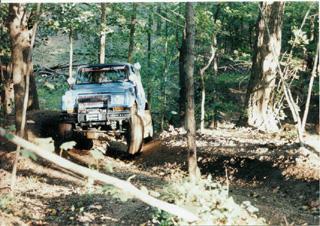 The two "recon" trucks started out on the trail with us but didn't make it very far. 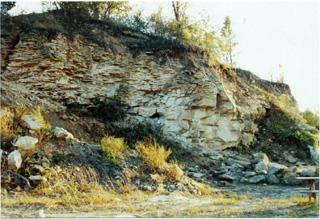 For those of you who have never been to the Badlands it offers a nice variety of terrain. It has everything from gravel pits, sand, mud, creek beds, rocks and narrow winding trails through a thick forest of trees. The trail that we were on took us through all of that and more. For anyone that was there for the Y2K ZookiMelt we were running the equivalent of an orange and pink trail. It had some very nice obstacles. At one point about half way thru the trail we came up to a difficult spot. Jody, who was in front of us along with three Jeeps, had taken the chute up the right hand side of the hill. Jody hollered at Mitch over the two-way radio that we use and said that he wanted us to use the left hand chute. Since we are only locked in the rear, and we run stock gears, he figured that it would be easier for us to make it up the left hand side. Well, no one in front of us had tried the left hand chute. So Mitch lined up the truck and mashed it. We got within fifteen feet of the crest of the hill and started to slip. The top of the chute was all loose and we were going nowhere. Mitch tried to back down and give it another go of it. It was so loose that we started to slide sideways at the top of the trail. Jody yelled for Mitch to stop and try to hold the truck there. He ran up and got Bart's winch cable and hooked up our rig. You could hear the slow winding of Bart's laboring winch as we were pulled up at a turtles pace on the loose terrain of the trail. There was a huge rock face at the top of the trail on the right and we were getting pulled directly into it. 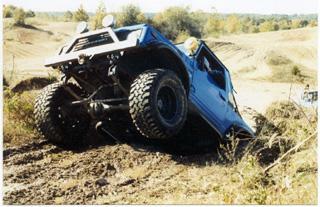 Bart stopped the winch and Mitch did the best he could to hold the truck there with the clutch and brake mashed to the floor. 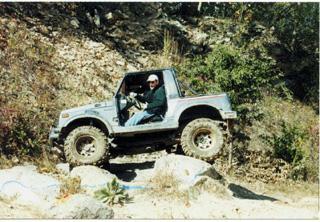 When they let the cable back out to reposition the Jeep, our Zooki started to slide again. It was the strangest feeling I have ever had. 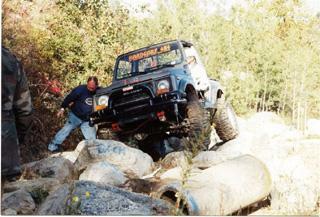 A different guy, who had a better angle, hooked his winch up to our Zooki and pulled us up the rest of the way. You do not know how happy I was to get out of the truck for a few minutes after all of that! The next hour or so was full of moderate to difficult obstacles including a very deep curvy part of the trail that was dug out with a backhoe and was full of mud. 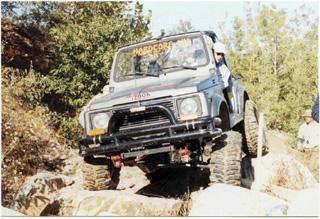 While the jeeps are just wide enough to make it thru without much of a problem, Suzuki's are just a bit smaller therefore making it more challenging to make it around the hairpin, off-camber left hand turn. 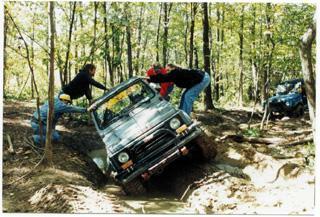 Jody and Mitch had more than a few people hanging on the truck to keep them from tipping over into the mud. We lost Larry and his wife along the way during the run on Saturday. They had a bad belt on the supercharger. While they ran into town to see if they could round up a replacement we finished the trail for the day. We met back up with them in the rock quarry. They had found a belt but it was too wide. Lucky for Larry, I had my pocketknife with me and he cut the width in half and sure enough it ended up working out! While the guys scouted out the course for the expert part of the rock crawl, Lisa, Terrina and I tore around the quarry area and had a good old time. After watching a few trucks, and walking the course with Larry, Jody finally decided that he was going to do the second part of the crawl. The course was a lot hairier than the day before. It was next to a huge rock wall, it twisted and wound itself closely to the rock and there was one nice turn that, taken the wrong way would probably put your truck on its topside in the water. Patiently, Jody waited his turn while watching and making mental notes. It was pretty sunny but still cold as can be. Finally it was Jody's turn. 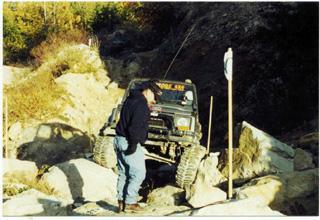 He was all of about sixty feet into the course when his truck dropped in between two rocks. Larry stacked a few smaller ones underneath the tire to help get Jody's Suzuki up on top of one of them on the right hand side. It didn't work. The truck slipped back down into the same spot, sandwiching it between the rocks. It came down with some force and crunched both rockers, blowing one rocker panel cover off and the other was barely hanging on. Jody called it quits. We called it a day as far as wheeling went, and headed up for dinner. Once again, the folks that put on the event had a nice spread of Barbecued chicken, corn and baked beans. It was now time for the raffle! While holding my tickets in my hand I was wishing for a new set of tires, 33" BFG mud T/A's. Instead of winning tires I won videotape from Sports in the Rough, The best of Johnson Valley. At least I won something. It was getting dark and colder than ever so we once again hooked up the Suzuki's to our tow vehicles and pointed them back toward the comfort of our warm inviting rooms at the motel. We were going to try to stay up and drink a bit, watch some more video and hang out, but we were all so tired from the days events that I think that we were all asleep way before midnight. We'd had a great day with no major accidents. It was going to be a long drive home so the sleep was a good thing. We were up and out on the highway by noon. All was fine, we had a great weekend, spending time with good friends and meeting some nice folks. Nothing compares to "The Badlands" around home so anytime we get a chance to head to Attica you can be sure that the six of us are going to make the trip again! I know I speak for all of us when I say that we can't wait until the 2001 ZookiMelt! Thanks to all the nice folks that put on such a nice event.